After many months of prayer, deliberation and advice we are relocating. We have been here in this house for 53 years but now we can no longer maintain the property or heat the house because of finances. 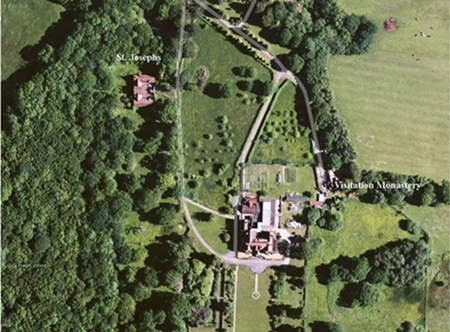 Within the Monastery grounds is a secondary building we have always called St Josephs. Sturdy and attractive we have only ever used it for candle-making, crafts and storage and also as our wash house in former days. Now it is to become our new home. It will need restoration and rebuilding, and is a major project. Next to it is a large pond that many of us remember having great fun on it in the punt. It was a favourite place for noviciate picnics, and many a tale can be recounted of pulling up tremendously strong water-lily roots, of cutting down trees that had fallen across the pond and of sisters falling in! We had one sister who regularly went fishing for eels! Still within our beautiful grounds, we hope to retain several surrounding fields and orchards. Click on the pictures below to see our plans. Please make cheques payable to 'Monastery of the Visitation'. If you would like to donate online please click the Donate button.